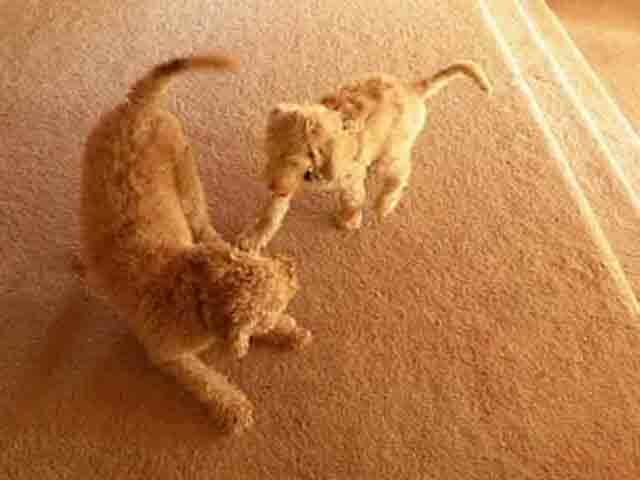 In dog society, where young Labradoodles must polish their manners before they are welcomed as polite company, three-year-old Jake gave valuable lessons on Saturday to three-month-old Barney, still small and just starting puppy career. There were lessons in restraint and gentling of play-bites. Jake taught advanced full-body leaning skills, which can also be used to nearly knock over people who are inadequately alert. When the first round of play was done, Jake calmly led Barney off the field of battle. The playdate was arranged by Richard and Arlene (below), co-owners of Barney and Jake, respectively.